and change 1 thing that you would have trained your dog differently in regards to, what would it be and why? I dont know about different but before I sent my dog to the trainer I would have tried to teach her less but get her more solid in those things. My first, too excited with the progress she was making and wanted to teach her more. She will be fine but that would have been the better way to go. as a first timer i have not just 1 but a list. 1) not so much wing on a string - i used to play with this one way too much. i used to hide the wing and let her find it, great nose work but not so good for holding point. i still think she looks for the wing on every point. she will creep in hoping to get the wing but now a bird flushes and then she is like, "darn it" i thought it would be the wing for sure that time. 2) no tone on the e-collar - i used it way too much eventually having to give the command two or three times before she followed it. when i started to break her of this she would look at me like, "hey that wasn't fair, you didn't count to three". 3) training with crappy flying birds - i should have started with pigeons and she would have never caught one. 4) too many situations to catch birds - her prey drive has always been on high so there has never been a need for her to catch birds. there were times i would run her without a cc which would give her a chance to catch some of the weaker birds, if i had another chance i would alway run her with a cc. Very good thread, maybe one for HOF. These are things we try to tell everyone that comes on here with a new pup wanting advice. A HUGE problem I see was nailed in one post, you see the pup learning and overdo it at that point. Letting pups grow up is so important. I would have to say...teach 'em that my bed is off limits. 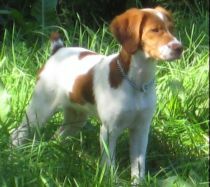 1st; Start with a younger pup, got Dutchess at 5 months. 2nd; Ild read more training books before I started. Put my old t-shirt I wore to bed in her kennel the first night she got home two week ago, she has slept like a log for two nites now just needing out once.Would have known that would have done it with the lab and 2 other gsps.made those first nites easier.Had the 2 GSPs inside a little longer before moving them outside for making them better inside dogs only one has proven herself worthy of alnighters.Nothing training wise very happy with turn out. great post, I am a first time trainer as well, but I do have a couple of things that I would do differently and some of them have already mentioned so I will not go into those. I would find more and larger places to let my pup run in open space and less time on a lead. I was not in the best situation when I first got my dog, but have since moved to a much better situation where he gets to run for an hour or so, 3-5 times a week off leash. But I feel that he has just now come around to a distance that I like and consistently runs there, were as before he was to close and I feel that was because of his lack of free running earlier. The other thing is that I jumped the gun on fetching. He loved it when I first got him and I encouraged it and then try to get to serious with it. He has just now come back around to loving it again, so nothing forceful all play. I will get more serious with that when he gets older. We still have a long way to go but am looking forward to training and learning more. 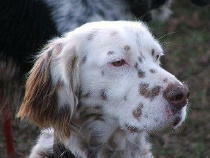 bwjohn wrote: I would find more and larger places to let my pup run in open space and less time on a lead. I was not in the best situation when I first got my dog, but have since moved to a much better situation where he gets to run for an hour or so, 3-5 times a week off leash. But I feel that he has just now come around to a distance that I like and consistently runs there, were as before he was to close and I feel that was because of his lack of free running earlier. sounds like my situation early on, and like you i do think this shortened her range but is slowly getting farther. it could have been a confidence issue too but i think the lead and confined city livin' didn't help matters. bwjohn wrote: The other thing is that I jumped the gun on fetching. He loved it when I first got him and I encouraged it and then try to get to serious with it. He has just now come back around to loving it again, so nothing forceful all play. this is a good one, much like my wing problem, newbies like us get so excited to see our pup doing something right so early on we want to see it again and again, show all our friends, and then go back to make sure they can still do it or haven't forgotten. oh yeah and we do it all in the same day its so hard to just let it be and not over-do it. I would have bought my launchers sooner. 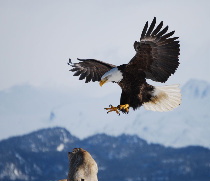 I don't see how anyone (who lives in an area without a large wild bird population) trains without them! My shorthair caught way too many pen raised quail when she was young. Once I got the launchers, they turned her from a catcher to a pointer in a matter of days I would also have built my coop and got my homers sooner...they are worth their weight in gold. I would have been more wise about the pup I bought. Innocently/ naively struggled too long with too many culls before I figured out the diifference it makes when you start with a "real" pup. When you're new/inexperienced there is always somebody to take advantage of you sadly to say. natetnc wrote: newbies like us get so excited to see our pup doing something right so early on we want to see it again and again, show all our friends, and then go back to make sure they can still do it or haven't forgotten. oh yeah and we do it all in the same day its so hard to just let it be and not over-do it. .·´¯`·... ><((((º> Tammy ·.¸. ><((((º> .·´¯`·. If I could go back, I would would have paid better attention to what I read here! I guess I have to learn everything the hard way. Specifically, I would: 1) concentrate on making him listen and obey commands from the first day he got home. 2) keep him on the check cord so I could control the playtime. As you can guess, all he learned in the first 3 months was forgotten once he understood that when the lead came off, he could do what he wanted. And so it was back to square one (with some professional help). I imagine where he might be today if I had listened to everyone here and focused on the basics until they were absolutely solid. DGFavor wrote: I would have to say...teach 'em that my bed is off limits. I don't think that that's possible! Every time I bring home a new pup, no matter how young, the first thing it checks out are the sleeping accomadations. I finally cured the problem by getting a bigger bed and a divorce! The only thing that costs more than a divorce is a new pup! Let's see, two TV remotes, three pair of shoes, about ten of the grand daughters stuffed animals, one cell phone plus various other odds and ends! Oh forgot to mention one ate a check book and one ate a wallet, contents and all! I'm a first-time bird dog owner as well. And if I could go back, I would have searched for a trainer first--puppy second. Considering how little my husband and I knew going in, we could really have benefited from some expert guidance on everything from breeders to training. 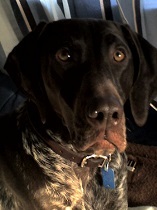 As it was, we brought Otto to our trainer for an evaluation at 6 months and had already made some mistakes (hiding bird wings and inconsistency in basic obedience training). 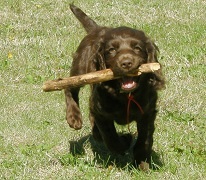 Sure wish I had stumbled onto this forum pre-puppy as well! Great advice here! mine would have been having pigeons ready instead of having quail that weren't good fliers which caused me major problems. mtlee wrote: I would have bought my launchers sooner. 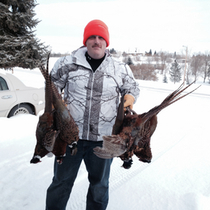 I don't see how anyone (who lives in an area without a large wild bird population) trains without them! My shorthair caught way too many pen raised quail when she was young. Once I got the launchers, they turned her from a catcher to a pointer in a matter of days I would also have built my coop and got my homers sooner...they are worth their weight in gold. Here's a post that should be in bold print. All the money we spend on dogs and hunting gear, the cost of launcher's is very small. Also, most people wait till they need birds to even think about them and then have trouble getting them. 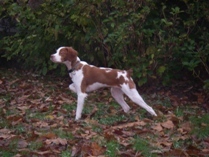 I would have taken my very 1st Brittany and deposited him with a trainer when he was a year old. He was my son's 8th birthday present and just turned 8 today. Every single time I run that dog, he runs bigger and faster! I made too many mistakes with him when he was younger (including neutering him), but he had all the potential in the world to be something really special. My trainer just shakes his head and tells me how he wishes he'd had Courage when he was younger. 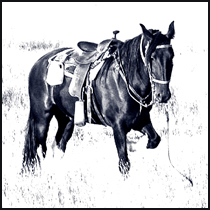 I would have taken riding lessons way sooner than I did and I would have followed my trainers advise and bought a nice 8-13 yr old experienced field trial gelding (not a 4 yr old green horse from a sale barn ). OR I'd have gotten a non-sporting breed 8 years ago. I'd have $$ in the bank had I chosen to do that Oh well, you can't take it with you, and you might as well have a ball spending it. 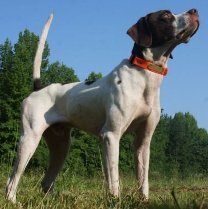 Wow, that would be a long trip beccause I have made just about every training mistake it is possible to make with a bird dog, often more than once. If I had to narow it down to one mistake that I would wish to undo, it would have to be the mistake that i made most often which got me and the various dogs I made it with in more trouble than you can imagine. That mistake is...NOT KNOWING WHEN TO QUIT. I cannot tell you how many times and how many dogs I have thrown under the bus, ruining an otherwise fantastic training session, just because I wanted to see "one more point" or "one more retreive" or "one more cast"... or, "just ten more minutes".... It is soooo hard to quit when you are having a ball and your dog is doing it like a champion. I always want...MORE. That's when I get the dog in trouble. Knowing when to quit is a lesson I have to keep reinforcing on myself. Maybe I'm, the one that needs to be wearing the e-collar. Hmmmm. If I could go back, I would have gone to a seminar sooner. I read several books and watched videos, but it wasn't until I went to a George Hickox seminar and got hands on experience that I started making real progress. I made many of the mistakes already mentioned, but I can't say enough about "pro" help...Hickox is good, but many others have them as well. Success usually comes to those who are too busy to be looking for it. LISTEN to my mentor on every single thing he said and not go my own bullheaded way on most things trying to prove him wrong. ONLY wild birds when he was a pup and NO pen birds. 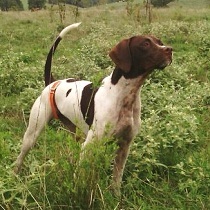 If I had to use pen birds, only great flying, hard flushing ones that he couldn't catch. Only put him on a bird or two every few weeks instead of lots of birds that caused him to flag. Saying nothing when he yo yoed back to me, put the proverbial duct tape over my mouth. I wouldn't have read all the books I read, but would have taken even more time to get my hands on more and more dogs at my mentors. DOING is the only way, not reading. Right on! A fellow alumnus from the School of Hard Knocks!! Seems to be just human nature that we learn better from making our own mistakes than putting trust in the advice of those that have already learned from 'em!! Brenda, I have to give all of the credit for telling me like it is, for telling me I was doing moronic things, that I was overdoing pen birds, overdoing everything, just being stupid overall...to Ronnie Sale. I had watched my granddad, dad, great uncles, cousin, train dogs by putting them on wild birds from the time they could walk. Dogs never knew whoa, never had gun conditioning, just got hunted. If they made it in spite of those men, then they became dogs. Ronnie allowed me to wash kennels, watch whelping, help with dogs, put my hands on a ton of dogs, see the bad ones and see how he fixed them. He told me a thousand times, " I care more about the dog than I do your feelings". He was always brutally honest. I appreciated it then, and do ever more now. Doesn't sound like a positive reference, be assured, it is. Ronnie will always be a great friend. Jim Smith was a great friend, like a brother. I miss him more each day that passes. He sold me that ugly dog that was pretty tough to beat and is still the best dog I'll ever own. I would either attend seminars or spend time helping a trainer whose methods you intend to follow or do both. Seeing how to properly execute the things you read about and knowing what the correct response looks like would be very helpful. Also, I would chose a training method which is based on using stimulation to get a desired response (as opposed to using negative stimulation to correct undesired behavior). The simpler the better. #1 My school of hard knocks really could be summed up in "who to trust". 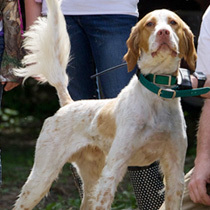 There is an endless supply of gundog experts in this world and stellar recommendations that come from any number of well-intentioned fools.It took me too long to realize that every guy peddling a pup actually believes what he is telling you and while he may not be intentionally misleading you, he also has no clue what you really need or demand from a pup. Many have no clue at all what a really good dog should be capable of and a farm kid who hunts several times a week actually could teach the peddler a thing or two! I guess when you get right down to it, I just wish there was a GDF around for my whole trip. There is a great deal of good info here and stuff that just was hard to come by for the previous 3 or so decades of my hunting/training career. 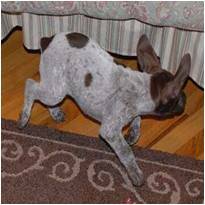 I've struggled with some junk dogs and learned how to acquire a good dog, all a process that could have been avoided had I access to a GDF all of these years. #2, I wish I had learned how to use an ecollar properly from a pro years ago. What a revelation, once you see how it should be done. Just let the dog hunt. natetnc wrote: as a first timer i have not just 1 but a list. I grew up in a time when we had a good wild quail population here in the South. 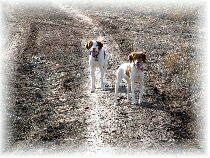 We taught our dogs to come when called, to whoa on command and then went hunting. The wild birds took it from there. When our bird numbers became too low to hunt we were forced to start using pen raised birds. I had to rethink all the training methods I had used previously. Your #3 really hits a nerve with me. I learned that lesson the hard way at the expense of a very nice young dog. 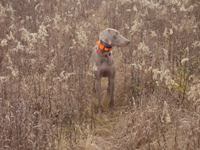 Nothing good can come from letting a young dog catch birds. In addition to taking them out on wild birds I would have included some structured launcher training using pigeons and pen raised birds. None of my dogs have ever been on pigeons or pen raised birds but I have a launcher and all the training tools and videos. I am even considering getting some pigeons and pen raised birds to keep them tuned up during the off season even though they get run on wild birds at least once or sometimes twice a week during the spring. 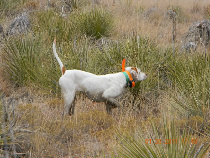 Summer is a hassle around here simply because of the heat and the strong winds which makes it hard for the dogs to scent but with some birds and a launcher I could do some simple field work. Another thing I would change was more patience on my part. 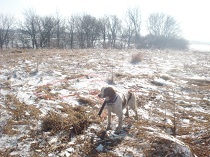 I get impatient when it takes a pup 7 or 8 times of being in the field to work out what we are looking for and to stop and point rather than flush. That isn't fair to the dog and is really dumb on my part by trying to let them figure out things on their own and getting impatient when it takes them more time than what I think is necessary to do it. I would also have them more prepared when entering the hunting season. I rarely use anything but a loud cap gun to condition my dogs to gunfire during training which means they have to get used to the sound of a shotgun during hunting season which has never failed me but it usually takes a dog at least 3 or 4 times in the field being shot over and being scared and me ignoring it before they catch on that gunfire means birds and they take off hunting. 1. Have the basics down pat, in stone, automatic, no matter what, before moving on. 2. Dont let the pup catch a bird. What are more common mistakes that newbies like myself make? I think it is safe to say we all talked too much with our first dogs. When judging or running with others (especially newbies), I wish I could tell them to shut up and/or swallow their whistle! I was as guilty as the next guy! Do not give a command unless you are there to enforce it. And if you need to make sure you enforce it! Do NOT use the e-collar unless you can see the dog and are sure it is needed. I recently saw a guy call his dog back to him to keep him from interfering with a fellow hunter's retrieve. The dog was in tall grass and he could not see him coming to him and gave him the juice. What really sucked was that the dog had already picked up the bird and was in the middle of the retrieve. The dog spit the bird out when he got the juice and now is not all that quick to retrieve. Thanks for all the great advice on this thread. I'm getting a DD next year and am glad to see such great info posted for newbies like me. Other than that its more about having fun and watching rather than correcting. Ohhhh and you should try more dog games and not pre-judge another sport. I would have gotten on the forum long before i did, to soak up as much as i could. Would have separated the two pups from the start when training. They fed off of each other and found out that they didn't have to obey me. 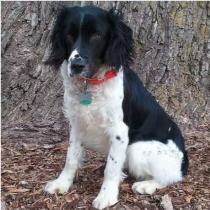 Karen wrote: I would have taken my very 1st Brittany and deposited him with a trainer when he was a year old. He was my son's 8th birthday present and just turned 8 today. Every single time I run that dog, he runs bigger and faster! I made too many mistakes with him when he was younger (including neutering him), but he had all the potential in the world to be something really special. My trainer just shakes his head and tells me how he wishes he'd had Courage when he was younger. Why? I am considering having my pup neutered. I got Moxy the last Friday in February. My mom passed away on Tuesday, the first of March. I would up missing a lot of class and dropping several classes and there was a lot going on. Working and messing with Moxy was the only thing that took my mind of of everything so I worked her and worked her often. As a result she saw way too many birds way too early and it laid a poor foundation. 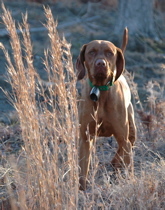 She never caught any, but it amputated her range and even now when I put her on a check cord and take to the field she'll automatically go to stalking because she anticipates birds in the vicinity. Makes it tough to train and I know it was a mistake, so that is what I would go back with and change with regards to Moxy. I should never have attempted to train with an ecollar with out professional help. I have made every mistake in the book....well not every mistake, I am sure their are still more to come. 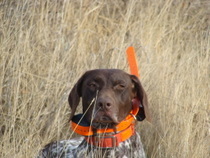 My GSP was 2 1/2 and "fully trained" when I bought her and brought her home. We spent seven months getting to know each other before I hunted her the first time. I had several conversations with the breeder and trainer and exchanged quite a few emails, too, during those seven months. At first, I wasn't real comfortable with her range and a lot of the focus of working with her was to shorten that range up. In hindsight, I wish I hadn't done that. Now, three years later, I'm working to get her back to where she was. Dog gone it, anyhow ... I made the same mistake with another GSP 25 years ago!! 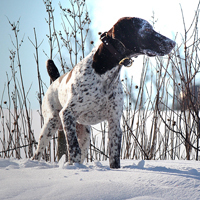 Stay away from NSTRA trials until the dog is steady. To many poor flying birds. She went from one bad fault to the next. I over trained till she would not acknowledge a pigeon, rocked or in a launcher. 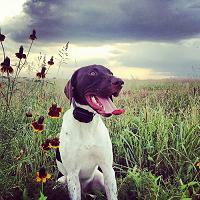 Teach your dog to hold point and flush the bird away from her. Do not shoot over their head. Work with a real trainer. Will Rodgers said there is a lot of difference between a farmer and a farm laborer. Same goes for dog trainers and dog owners.